Born in Brandon, Dallis who was also known as "Knobby" began a 40 year career as a sportswriter in Saskatoon, Kitchener-Waterloo, Calgary, Vancouver and Prince George before finally landing in Winnipeg. He was first employed at the old Winnipeg Tribune and from September of 1968 until 1990 covered the sports scene for the Winnipeg Free Press. During his years in Winnipeg, he covered the MJHL, WCHL, as well as the WHA and the Winnipeg Jets. 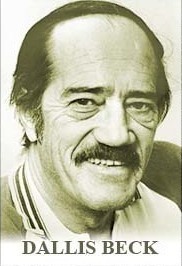 Beck was inducted into the MSSA Media Roll of Honor in 1990.